Justin Bieber is not pleased whatsoever with Twitter’s new algorithm update that ultimately blocked him from showing in the Twitter Trends list. Bieber has dominated the Twitter trending list for weeks – perhaps even months – and spoke out against the via… you guessed it – Twitter! “I heard you changed your system to stop my fans from making trending topics?? Really?? Where is the love? 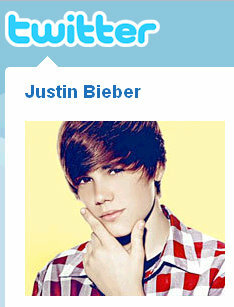 ?” Bieber tweeted to @twitter on Saturday, the service’s official Twitter handle, according to MSNBC.com. On May 14th, Twitter announced that a new update to the Twitter Trending algorithm has been implemented, and instantly – just like that – the reign of Justin Bieber on Twitter Trends came to an end. To add insult to injury, no sooner did Justin Bieber get booted from the Twitter trending list did another young up and coming star emerge on the very same list – Greyson Chance! Greyson Michael Chance is the 6th grader who’s YouTube video has gone viral and ultimately ended up landing a gig on Ellen. Most of the day yesterday – Saturday – the word “Greyson” was trending on Twtter. Man… that must have made Justin Bieber pretty upset.